Your future is brilliant and bright and glorious. When I first arrived at New Gokula Mandir in the Autumn of 1984, there was a Bhakta ashram and a Brahmacari ashram. On the journey between the two, in the parking lot, there was an odd "dwelling" referred to as "Dadhi's Dairy." With the morning programme, lots of service (especially washing Srimati Radharani's Pots), six-day-a-week Harinam Sankirtan (six to eight hours duration), and then every night except Sunday at the Bhaktivedanta Yoga Centre or the Sunday Feast, there really wasn't a lot of Time to explore. From the morning programmes I knew HG DadhiHarta Prabhu lived at the Temple, yet I made no connection between him and the "Dairy" that bore his name. As often happens, situations change. After about ten months, my service became travelling/collecting/preaching. Upon our one a year return to the Mandir (around Ratha Yatra), I was told that we could "hang" at "Dadhi's Dairy." After a day of collecting, we came back to the ashram, showered, attended the Evening Progarmme, and then RAN to the "Dairy." My first visit was truely awe inspiring. The first thing Dadhi did was introduce me to Their Lordships Sri-Sri-Radha-Devonshire-isvara. Appearently Devonshire cream was an essential part of the "Dairy." Then came the unique and uplifting association that only DadhiHarta could supply. He was fun, bright, loving, caring, and totally "Prabhupada's Man." And the prasad was COMPLETELY UN-WORLDLY! The chance to just be ourselves, with respect of each individual but free from all trappings or pretentious attitudes was an atmosphere that DadhiHarta naturally and effortlessly created. A "safe-haven" from worries and troubles, free from politics and material worries was always as close as DadhiHatra's door. And we can never forget that the reason Saranagati exists today is due to DahiHarta convincing others to buy shares in this "inland desert" (as some labelled it) abd grow it into an oasis of devotion. There is so much that can be said. There are many tales to tell. Let us never forget the amazing things done by HG DadhiHarta Praabhu. I have known Dadhi Harta for over twenty years, but never have felt closer to him than I have in the last year or so. Every time we saw each other, there was rarely a word exchanged that wasn’t about where the spiritual enthusiasm was coming from lately, and where it might come from in the near future – “Bhajans tonight? Yesssss! It’s happening, right? Oh, too much! This is exciting!” I really appreciated that, seeing how someone could be totally satisfied…more than satisfied…ecstatic…about Krsna consciousness and only Krsna consciousness. A few times he shared with me his simple secret: chanting japa was far and away his daily priority. We even exchanged Prabhupada quotes and letters about it, and each time he heard a new quote his words and body language showed his conviction soaring to new levels. Another fact he shared with me which I find very special is that he had his own morning program every morning. A couple years ago, he breathlessly asked me to transfer a cassette to digital media and to help him buy and mp3 player. The cassette (which he said was dearer to him than anything) was so old and worn that actually it did not survive the transfer, but I managed to salvage most of it. I sheepishly gave him back the ball of tape that was his cassette, but he was excited the content was on his new mp3 player. He creatively connected his mp3 player and speakers to a solar charged car battery, so it would play virtually nonstop. Every morning of his began with the track that was on the cassette tape, which was a 1970s morning program in Vrndavan or Mayapur (I can’t remember which), which he personally recorded. But the sweetest thing was, throughout the mangal arati, Tulasi puja, etc. his emotion-filled voice could be heard singing along in full enthusiastic joy. Another exchange I am very grateful for is when he came to Govardhana Academy this last summer to speak to “the future devotees of the world” about why he became a devotee, why he remains a devotee, and what advice he has for all aspiring devotees of the future. I won’t get into details here, because he actually typed his “story” on his type-writer, and I am hoping the complete story will be salvaged and shared with everyone. However, I did record it, and will attach here a tiny excerpt of the 90 minute talk, which I hope will inspire people who can hear in it his inner strength and life purpose. I will miss him. He was so connected to the mood of our Krsna Balarama, often bringing Them presents. He also would bring presents for the students, such as caramels, popcorn and so on. And inexplicably, he would even bring presents just for Radha and me, labeled as such and wrapped beautifully. He relished all the spiritual programs with such fervor, and savored prasadam like he was tasting it for the first time. He was truly ‘honouring’ all things spiritual. I remember playing hockey with him when he was in his early 60’s, and saying I hope I would be like that when I was that old. Well, now I hope I can be like he was in his late 60’s – so spiritually fit and eager for Krsna fun. It is always a pleasure for me to visit Saranagati and on each visit to venables valley (Saranagati) I would always make the effort to see the various chakra points or places of attraction...you were always one of those important chakra points...you were always kind to me you were always gentle. Whenever we had discussions between you and I we would always discuss topics of social values and if there was a discussion to make with regards to social moral issues you and I would always nod our heads to the phrase "we have to do what Prabhupada would want". I will always remember you on this theme "what would Prabhupada want" you were always his man...a real trouper for Srila Prabhupada. So we will miss you very much and please remember us as we struggle in this mortal world while you have finished. Dadhiharta prabhu's personality and devotional conviction truly attracted my heart to this holy abode. And although we only had one or two substantial conversations, I witnessed an instant bond develop on its own accord without any extraneous endeavor. After hearing the experiences of the many devotees that lived here, I was dumbstruck with how I experienced virtually all of those qualities so clearly within my own limited experience within such a short period of time. I heard numerous accounts of how he sacrificed everything for the sake of Prabhupada's devotees, lived in such austere conditions, was entirely selfless, was completely detached from all worldly wealth, and how he dedicated his entire life and soul to the mission of his beloved Gurudev, Srila Prabhupada. Then, I really began to ponder the mystery of genuine Vaishnava personalities and how from a very microcosmic and personal perspective a personality can shine so brightly and exert such spiritual influence while simultaneously being hardly noticeable within the community. There's no doubt that Dadhiharta prabhu empowered the spiritual force behind all the wonderful and magnificent achievements that Saranagati has shown to the world through his mystical and almost invisible ways. In a precious sat sanga at Govardhan Academy he spoke so plainly of the guiding light of his life, "I seek to lead by following." These few words encapsulated who Dadhiharta prabhu was to everyone. So wonderful was his life, quietly revealing the miracles, majesty and indescribable sweetness of Krishna consciousness. I first met Dhatiharta prabhu in downtown Vancouver in 1985-86?. I was going to a night club and my roommate and I had called a cab. We jumped in the cab and saw that the cab driver had an orange toque on hhhmm... we though, we know those toques! then we had noticed a book , I believe it was "Coming Back" and I said from the back seat " we know who you are!" he said "Oh yah" and I said "you are a Hare Krishna!!" "I recognize your hat and that book!" he was surprised and we laughed. I don't remember if I got the book or not. I can't believe I won't see Dhatiharta prabhu's smiling happy face next time we come to saranagati for a festival :( I am so glad we sat together at Balarama's festival. Dhatiharta loved to hear the rascal pastimes of our boys and the naughtier the story the harder he laughed. We laughed and ate some wonderful sweets as the wind blew across the valley. He was always a pleasure to speak with and he was always cheerful,respectful and spoke about everyone with love and devotion. We send our deepest condolences to all his friends. Please accept my humble obeisances . My pranams & dandavats to your grave.All glories to Srila Prabhupada! I am so sorry prabhu that I know you not so much, but the little time that I came across to know you it restore my heart& mind remarkable memories! I think although I am not so close to you like the other biological god brother & godisters, you came close to me to know you by your kindness & humility. Meek a humble always ready to offer your respects to others. Always glorify the other devotees& privy to fault finding. You talk to me once, and very kindly explain, that I dont have to worry about others doing wrong to you! You use the most compassionate& nectarian words to let me know. Its so impressive that you render so nice seva to your community Saranagati dhama. Service that pleased so much the devotees &your spiritual master Srila Prabhupada and Lord Krsna Himself. You pleased the whole world. The secret Cow seva! Krsna the lover of the cows& cowered boys the dear son of mother Yasoda& Nanda maharaja reserved a space for you there in the Spiritual world place with no return! Now perhaps pasturing the cows somewhere in Vaikuntha loka in complete peace & happines!Please pray for me/us conditional souls to achieve the same goal& result and qualities of a surrender soul to Gurudev Srila Prabhupada and Sri Radha & krsna! Dadhiharta prabhu I think I know a lot more now that my memory awakens ! You were a very nice transcendental uncle & friend! I will never forget you! Hare Krishna, Please accept my humble obesiances. All glories to Srila Prabhupada, Guru & Gauranga. I first met you sometime in 1986. I remember when you asked me to take the ashes of Urukrama Prabhu to Vrindavan and I complied. That was the special mercy by you to me. Because this incident convinced me that Lord Krishna takes care of His devotees no matter where they leave their bodies and philosophy of Krishna Consciousness is practical and fullproof. Latter on you helped me to take up the Treasurer's service sometime in 1988. During initial times you always encouraged me and gave me lot of support to continue and stay in the service. In difficult times I could always count on you. Lately whenever you visited Vancouver you always asked me for my welfare and continued to praise Srila Prabhupada and Lord Krishna. In your regular monthly LOD payments cheques you wrote encouaging words and always thanked devotees in Vancouver yatra for continuing to carry on Srila prabhupada's mission. I am confident that you are well taken care by Srila Prabhupada & Lord Krishna. I will definitely miss your smiling face and encoraging conversations. I stayed in Saranagati this summer and it was my first time being in the auspicious association of devotees. One person who made me feel welcome right away was Dadhiharta prabhu. When I went to the sunday feast for the first time I brought fruit salad in yogurt and I was nervous about whether it was good enough. Dadhiharta came up to me afterwards and kept saying that "it was something out of the spiritual world!!" I remember working around the farm with Dadhiharta and I was amazed at how hard he worked everyday and hearing him speak about Krsna was even more amazing. Everytime we got into his truck he would pull down the sun visor to see a picture of Radha-Krishna he taped there, and he would comment on how beautiful They are. He came to the school one day to speak about his life and what I remember most was how serious he was about chanting 16 rounds everyday. He had so much nectar to share and Krishna is so kind that I was able to meet Dadhiharta prabhu. When I left the farm in august saying goodbye to him was especially hard, but Dadhi assured me that we would see each other again, somewhere. I have fond childhood memories of some of Dadhiharta's contributions to the Vancouver temple. Most of all that old Pop-Shoppe machine. It was an old style soda dispensing machine with glass bottles containing exciting flavours like lemon lime and grape pop. To retrieve your purchase you had to hold a little door open and use this hook to snag the bottle cap and pull the bottle forward. Simple details can leave impressions on us for life and give us memories to treasure. I will also cherish my more recent memories of Dadhiharta. Rather than someone guilting you for wasting prasadam at the Sunday Feasts (which, believe me there were when I was a kid), Dadhi would happily collect everyone's scraps, letting you know how terribly excited the dogs were going to be for these tidbits. His buttery rice will be fondly remembered along with his light-heartedness and enthusiasm for service. It is hard to imagine the Sunday Feast with out his smiling face. I hope I can take this reminder to appreciate people for the smaller things in life. i first met dadhi before his heart attack; at that time his mood was a little critical of this and that, and a smile my way was a rarity. then the heart attack and what a change of personality. i can honestly say from that day, our only exchanges were those of respect and love for everything kc. he spent his time well taking advantage of what saranagati has to offer. he attended every weekly cc reading at our ashram for years. he attended every bhaktivinode bhajan at our ashram for years. he attended every sunday program and festival for years. and did so with such unabashed and almost child like enthusiasm. his appreciation for krsna prasad was resolute; even hearing it described he felt joy. in your honor today, mentally sending you platters of sandesh, sop, burfi, cake, pastry cookie, and ice cream varieties. what a joy to see a devotee mature in the way you have done at the fag end of your life. i feel great happiness at your passing now. often we joked about the condition of these elderly bodies. and oh how he could talk about solar power! So many memories and yet so few. Dadhiharta was not a fault-finder, instead finding something good in all. His commitment to Saranagati and to cow protection was absolute. Dadhi was the epitome of the phrase "grace under fire". He had learnt to deal with any limitations that he had, making light of them, and maximized what he could to use in Krishna's service. He was humble, he was kind, he was funny, he was eccentric. But most of all, he was devoted to Srila Prabhupada and to the lotus feet of Sri-Sri Radha Krishna. We were such fortunate souls to have known such a special soul. Thank you Dadhiharta Prabhu for your association and friendship. We are remembering so many wonderful things about Dadhiharta das. Dadhiharta was a dedicated attendee of the weekly Caitanya Caritamrita readings at Banabehari mandir for many years and last Wednesday we were reading the very moving and emotional description of Lord Caitanya's madness in ecstasy of love of god, including the description of His bodily limbs elongating and then contracting and how He mistook Cataka Parvata hill for Govardhan and raced after it. Also we read how when locked in by three doors at His residence He somehow got out and went to find Krsna. During the reading Dadhiharta became increasingly emotional and excited and I mentioned to him afterword that he seemed to be almost overwhelmed by the reading. His reply was that "there was so much happening" and it was too exciting. It was after this that he experienced his heart attack and although we felt saddened by his passing, we also felt that he had the most wonderful opportunity to cultivate Krsna Consciousness in this later part of his life with the parrot festival, the Govardhan parikrama, kirtans and bhajans and CC class--his life was full of blissful Krsna Consciousness activities. How fortunate he was to have this blessing. We remember how absolutely overwhelmed he became at the mere mention of prasadam--especially what Lord Caitanya or Lord Krsna ate and it gave us great pleasure to give prasadam to him as he was the true connoisseur of appreciating prasadam. We also remember his sweet and innocent enthusiasm for all this related to Krsna or Saranagati or his beloved cows and other animals. There was a sweet simplicity which characterized all his dealings in the last years and we relished his company because of it. Although we will miss Dadhiharta, we are certain of his promising and bright future. Certainly he will be given the opportunity for ever coming nearer to Krsna and the perfection of bhakti. He also spoke of his readiness for the next exciting journey with an almost longing enthusiasm. We loved Dadhiharta and we wish him godspeed with all our hearts. I remember the first time visiting Saranagati. Dadhiharta Prabhu welcomed me as if I were long lost family. I felt like an instant warmth and friendship with him. One Fall festival, we washed and bagged a mountain of Jerusalem Artichoke together. I asked him, "Prabhu, whatever do you do all winter long here at the farm?" He said, "Well,... I throw another log on the fire and chant Hare Krsna." I will always remember that! Thank you for sharing your simple life of loving devotion with us, Dadhiharta Dasa. You are going to be missed. I first met you at the 16th. and burrard temple, and what struck me then and throughout your life , was your gentle humility and soft behaviuor with everyone.This quality of humility was ever present in your personna , and illustrated to me your deep attachment to Srila Prabhupada and the Holy name. Also , the memories of you making oodles of ice cream prasad for Lord Krishna and his devotees will remain in the corridors of my mind for ever. Lastly, your determination to take care of the few cows at saranagati, to the very end, is admirable. I am sure that whereever you are now , it is in the spiritual embrace of Lord Caitanya Mahaprabhu, and Srila Prabhupada. We in Saranagati Dhama are all feeling acute separation from you, all glories to your dedicated life to Srila Prabhupada. Your friend and servant, Kripanidhi das. Dadhiharta Prabhu is a truly awesome devotee. enthusiastic about devotional service, all aspects. And his undying loyalty to Srila Prabhupada. or festival or something, with his mischievious smile, "well now, Does it get any better? you just tell me, does it get any better?" there is only a drop of butter in it - just a little.."
remnants of all the devotees. feast, or dig an outhouse or take garbage to the dump..
And attending every program that he possibly could. "OH so much fuss over nothing. Tempest in a teapot. Tempest in a teapot. Chant Hare Krsna." and as much devotion as I could muster. All glories to Dadhiharta Prabhu! Do we need to make a donation to help cover the funeral costs? Please let us know. I remember the first time I met him was on the altar on l6th and burrard temple.Worshipping Sri Sri Radha Madan Mohan. which truly helped keep me a float. also to financially help support the temple. and french fries cooked in ghee. HE also had a soft drink machine that would play different devotional tunes whenever you bought a drink. He devotionally transformed a pop machine! It was far and inspiring. bodies in a mud pack by the Ganges river and just freely and blissfully laughing a lot in Mayapur Dhama. goal. He used to tell me "I could leave at any time. Consciousness. He loved prasadam like no one else. I'll lmiss his buttery tomato rice prep at the Sunday feast. and his personal hugs, smiling and selfless service attitude. He'd do anything for anyone if he could. I can only cry right now, in separation of his association. In 1976 the sankirtan headquarters for ISKCON of Western Canada was a makeshift office located in a corner of the basement at the 16th Ave. temple. Dadhi Harta prabhu was the face of that office. His oficial duties were taking in the days collections and keeping the bookroom stocked. His unofficial service was to greet the worn out foot soldiers when they returned home after a day of batteling maya in the parking lots. He performed that service splendidly. Without fail, every single devotee who came anywhere near that office was made to feel the joy of surrender to Krsna. Dadhi Harta, quite spontaneously was the Krsna Conscious epicentre of that sankirtan office. That is how I like to remember Dadhi Harta, bubbling with happiness at the end of the day. I also remember his habit of falling asleep with his brahmin thread wrapped around his thumb. When he did that he looked like a child that had contentedly fallen asleep in the lap of its mother. During the final years of his life Dadhi Harta never deviated from his vow of chanting at least 16 rounds of the maha mantra daily. I am certain of this. He was also a weekly regular for Caitanya Caritamrta readings, Sunday Feasts, and all manner of sangas. If it was written in his daytimer he was there. All things considered Dadhi Harta prabhu certainly achieved success in his Krsna Consciousness. We are happy for his significant accomplishment in his life, and we are confident that he has been abundantly rewarded by Lord Krsna. Gee, and he always made the best rise, and mash potatoes and ice cream. others, I will miss you very very very much. all the care and love any mother would give to her child. Mayapur and was not sure when I would be coming back to Saranagati. But we never knew Krsna was going to take you so soon. he gave me your association that day. said it was always fresh each time you heard it. talk of so many things and time would go by so fast. and you had it down to a science. for the day we can be together again back home back with Krsna. Your eternal friend and servant Madana Mohana das. Dadhi Harta Prabhu has a very special place in the history of Saranagati. Certainly he is a unique soul, and all of us have fond memories of him dating back to 1973/74 at the 16th Ave Temple when he became a devotee. For me, though, what stands out, above all those memories, is his contribution to the development of Saranagati Village. Upon becoming a devotee, he very quickly grasped the importance of Srila Prabhupada's vision and instructions to build self-sufficient communities based on varnasrama principles. He dedicated 100% of his energy and service to this end. His committment to Srila Prabhupada's Saranagati project was unwavering over time. Right from the very conception of Saranagati Village he was an active participant. Many meetings and much discussion took place leading up to the purchase of the Saranagati land . The key and critical question at the time was "is there enough water to support a community of sixty families - water for homes and gardens, water for field crops, especially 30 to40 acres of grain production, water for pastures and hay production for a minimum of 40 cows...? We were young and inexperienced and this question challenged us , especially because we knew that the land was in a very dry ecosystem. It was Dadhi Harta who did the research. In doing so, he spent many hours in the library, consulted with professional agrologists and engineers in the ministry of agriculture and in the end brought forward to the table the data we needed to make a decision - "to buy or not to buy". Knowing that the land purchase included the water licences on the main creeks feeding into the valley, especially the big creek to the north, we could make the necessary calculations that gave us the confidence that making the purchase was indeed, the "right" decision. Of course, we could understand that much would have to be done in order to utilize these water resources and build a self sufficient community that would be pleasing to Srila Prabhupada. Many of those devotees who were originally involved in making that decision to purchase this Saranagati land are no longer around, but Dadhi Harta's commitment and service to Saranagati has never wavered. He has always been here since the beginning, humbly performing the many tasks required to nurture a fledging community, whether caring for cows or filling potholes in the road. We fondly remember his strong support and participation in the Fall Harvest Festivals and the Spring Planting Festivals over the past 10 years. 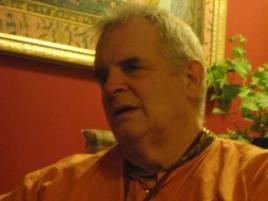 We are very sorry to hear of the passing of our friend, Dadhiharta Prabhu. Sadly we will have no more of his cheery madcap association, which was always so humourous and endearing. I did not know Dadhi previous to moving to Saranagati, and so do not have the long history many in this area had with him through the Vancouver Temple sangha. I got to know Dadhi just after his stroke, and was always struck by the humour, humility and grace with which he dealt with his newly limited condition. He regarded his lot in life as Krsna's grace, and was grateful for even the smallest of kindnesses shown to him. Dadhi could go on and on about an issue at hand, but it was impossible to be curt or abrupt with him, because of his undeniably earnest and modest nature. He was militant in his campaign to ensure the water was running for his beloved cows, and we knew whenever there was an interruption in the flow, because we'd hear his little grey pick-up roaring down the road into the South end to see how the problem could be remedied. He was always effusive in his appreciation for the efforts of the devotees, and especially for the prasadam at the festivals, which he loved so much. I don't know if I have ever seen a devotee who loved maha prasada more than Dadhiharta. His creamed fruit surprise was the favorite of many of us at the Parrot Festival, and I told him so. I will always remember Dadhi scribbling notes in his Daytimer - you could always count on him to know what had been said and by whom about such-and-such topic, and when the upcoming meeting was. He was a genuine character, and one of a kind. But beyond all of his endearing traits, I know we all celebrate the fact that Dadhiharta Prabhu was such a sold-out devotee of the Lord. He was one of those rare souls who doesn't care for the esteem of others, but is only happy to be engaged in devotional service to Sri-Sri Radha and Krsna, and is grateful to those who engage him. He was never a one for party spirit, but always accepted all devotees with love and respect, and I honestly don't remember ever hearing him give in to finding fault with others. This is the kind of devotee we want to associate with. I only wish now that I had taken more time to get to know him better. And this is of course why we lament the loss of a godbrother: we are confident that by the grace of his Gurudeva, Srila Prabhupada, he is well on his way to perfecting his bhakti to Their Lordships' lotus feet, but we are bereft of his association, and the sadness is undeniable. Thanks, Dadhi, for everything you gave us, how you contributed to the fabric of Saranagati, and made all of our lives better by your association. You will be dearly missed. It is with great sadness that we learned of the passing of our old friend Dadhiharta Das. Our time in Saranagti, brief though it was, was made all the more pleasant by his association and the many wonderful times and conversations shared over dinner. He was a very kind, compassionate and caring soul and very devoted to Srila Prabhupada. One of my favorite passages in the Bhagavad Gita is Chapter 5, text 18 “The humble sage, by virtue of true knowledge, sees with equal vision a learned and gentle brahamana, a cow, a dog and an outcast.” This verse comes immediately to mind when remembering Dadhiharta prabhu as his compassion was unconditional and extended to all spirit souls especially to animals. He was always willing to show kindness and provide a home to a stray dog or to care for cows. He also had a wonderful sense of humor and was always quick to laugh. When I would play music in Ashcroft at the Opera House Dadhi would surprise us with a visit and we so looked forward to enjoying his company. He will be fondly remembered and very much missed. I did not know Dadhiharta very well, but I remember him being a part of the valley and the community ever since our family moved to Saranagati. He was always kind, caring and compassionate towards people and animals. He was a good person and a good devotee, and was never judgemental or unkind. The last time I spoke with Dahiharta was in the fall about fixing fences and his cows, which he cared deeply about and spent much of his pension on. Although he did not pass away surrounded by the devotees from his community, he spent his life spiritually and in Krsna consciousness, and he is undoubtedly in a better place. I wish him the best in whatever journey he has now embarked upon. never forget your kindness to them or your gentle loving nature. happy because I could feel that he accepted me just as I am, defects and all. surely passed the final test and are in the personal company of Krsna. Hare Krishna. On behalf of our family, I would like to put forth a few words in honour of our Dear departed friend, Dadhi Harta. Always a kind, gentle, and forgiving Soul, he never found fault with anyone! We had the opportunity to live as his neighbor for a year, and took this as a chance to have Dadhi's association almost every night for our family dinner. He was like a Grandfather to my children, and always offered kind advice pertaining to His beloved Lord Krishna. Despite his illness, and some bad days, he always made His way down the hill to feed the cows, and talk and chant to them. He chose to live in that simple way, so that he could remain ever remembering His Lord, and not be distracted by material desires. We will miss you very much Dadhi Harta, as Brajananda always called you, "Old Milkman", may the light of your devotion, guide you home to the Lotus Feet of Srimati Radharani. Jaya! Theresa, Braja, and family. Nov 27 2010. steadfast." (Nectar of Devotion 21.23). Krishna's will and thus as good as done. around that humble, out of the way shed and its sole human resident. now accepted you as a steadfast servant in Their eternal company. he worship this deity he named Devon ishvar with devon cream and toward the end of his life took responsability for cow protection. Dadhiharta, he left too soon, but it would be selfish if I say I want him back, only because I know he is now in Golaka Vrindavan, where he will herd cows for ever, and ever in spiritual bliss, with Krsna by his side. Good by for ever Dadhiharta, you and your determination, spiritual power will never be forgotten!